The Duchess of Cornwall added another piece to her badge collection this week. During an evening reception for the Worshipful Company of Plaisterers on May 27, she was presented with a special version of their livery badge. The Duchess was made an Honorary Liveryman of the guild in April 2014. Seeing an opportunity to encourage the work of young craftspeople, the Company held a competition for the design of the brooch through the Goldsmiths' Centre and The Goldsmiths' Company. The winning design was created by 19-year-old Joshua Ganes and was crafted at the Centre in the studio of silversmith Clive Burr. 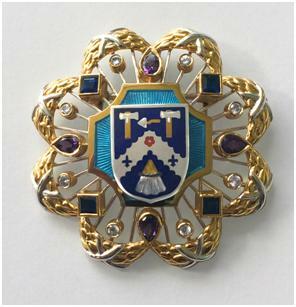 The badge has the Company's coat of arms, which includes depictions of plastering tools, at its center and a surround that was inspired by the plasterwork at Plaisterers' Hall. Made from silver and silver gilt, it also includes white and blue enamel together with diamonds and blue sapphires. It can be worn as a brooch or as a pendant, and will surely be used by The Duchess of Cornwall for all future events with the Worshipful Company of Plaisterers. For more, see these pieces by Professional Jeweller and The Goldsmiths' Company.